The Christians in Damascus didn't know what to think of him. He began to preach in their city and became more and more powerful. Some of the Jews decided he was dangerous to them and started looking for a way to kill him, but Paul learned of their plan. His enemies watched the city gate day and night, determined to grab him when he tried to leave the city. Paul and his friends had other plans, and God wanted Paul to survive to preach in other cities. This was their plan: They got a large basket, big enough to hold a man. They tied ropes onto the basket to lower it to the ground. 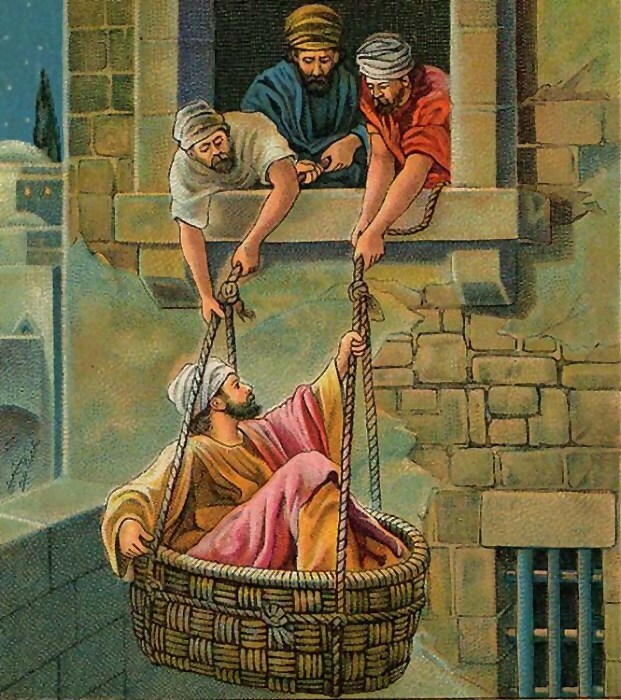 When it was dark, Paul got into the basket and his friends lowered him down through an opening in the wall. He didn't use the city gates at all! His enemies' plan was foiled and Paul left the city in safety. He went from Damascus to Jerusalem, but the Christians there feared him also. Barnabas, good Barnabas, stood up for him and told the Christians that Paul really was changed. He was accepted by them and preached, but it became dangerous there also when the Jews from Greece tried to kill him. His friends took him to Caesarea (ses uh REE uh) and then sent him off to Tarsus, his hometown. Paul had some good friends. Friends help one another. You can be such a helpful friend. Your friend's life is probably not in danger, but he or she may need to be encouraged. Friends may need to know that you will be there when others ridicule them or tell lies about them. Be ready to speak a good word and stand up for your friends. Be a loyal friend. thank you so much God bless you! What a wonderful website!! These lessons are great. I teach Sunday School at a very small church so these are perfect. Iwas wondering which direction to go in next and the Travels of Paul seems like a great idea.The writings of Paul mean so much to us so it will be great to share his ministry with my class. I expect to learn a lot along the way as well. I hope things are going well for Murray. Love and Prayers. This page displayed 137,381 times.